Welcome to Season 2019 – here’s some important information regarding 2019 registration. Registrations open online from 3 January 2019. Go to the Play Football online registration page (new look), and follow the prompts (it’s the same as last year – and really easy!). All players new or returning MUST upload a NEW PHOTO for 2019. Photos need to be uploaded at the time of online registration. A passport-size photo is the best to upload and must include the whole head in the frame – no shoulders otherwise it will be rejected. Remember – no photo, no registration! Apply for active kids voucher on Service NSW website by following the prompts. Register on MyFootballClub, and input the voucher code on the payment page. If you registered prior to the 31st and have not paid, delete the existing invoice and register again, inputting the voucher code. If you have already paid, send the voucher code to [email protected] along with your full name. Registration day will be held at St George Maso’s (86 Roberts Avenue, Mortdale) on Sun 27 Jan Sat 2/Sun 3 February and Sat 9th between 11-3pm. Club officials will be available to check proof of age for new players (original birth certificate, passport or drivers’ license) and accept registration fees as well as answer any questions you might have about Season 2018. Everyone will need to collect gear that day (see below). You will need to attend Registration Day to supply proof of age – a birth certificate, passport, or drivers licence. This will be verified by a club official, a photocopy taken and the original returned to you immediately. You must bring the original document as photocopies CANNOT be accepted. This is particularly important for players 6 and under as almost all will be new registrations – best advice is, if in doubt, bring along some ID. We will not be chasing you or allow these to be emailed as this caused many problems last year. I want to register as a student – what do I need to do? Student registrations will NOT be approved unless you provide proof (for example a print of your 2019 enrolment or a valid 2019 student card). This means you will need to turn up to Registration Day. Again, we will not be chasing you! If I registered online do I need to attend Registration Day? YES! EVERY registered player needs to turn up to collect the new 2019 playing gear. All NEW players must come to have their proof of age confirmed and collect gear. All STUDENT registrations need to come to show ID. EXISTING players need to come to pay registration fees, receive family discounts and collect 2019 gear. What do I need to bring to Registration Day? registration fees (if not paid online). Please note you MUST REGISTER ONLINE before you turn up (otherwise we will send you home to register as we cannot do it for you). 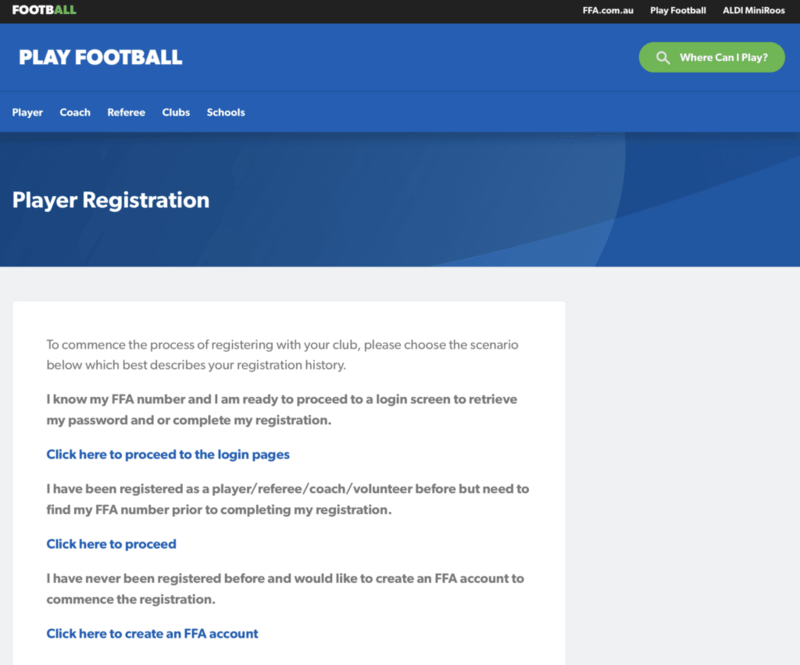 Registration fees may be paid online when registering (note this attracts a 3% transaction fee for third party management to the FFA, NOT to our club!). Just follow the instructions. You can also pay by cash or EFTPOS on Registration Day. The Club has maintained our fees at 2018 levels, however increases from FFA, FNSW, SGFA combined for 2019, has added an extra $15 across the board. NB: $100 can be deducted for all school students with the Active Kids Voucher available from Service NSW online. All players receive a new training shirt, shorts, socks, All kids aged between 6-9 and NEW players aged between 10-12 will also receive a ball. Plus all new registered players receive a bag. You MUST come to Registration Day to collect your gear in person. We also hold our wonderful Junior and Senior Presentation events at the end of the season, and several other social activities throughout the season. What is the family discount? To receive the family discount you MUST attend Registration Day and get a refund (if you paid online) or to pay the reduced amount (if you didn’t pay online). Please note the maximum discount for any family is $100. What if I’m a Coach, Manager or RTO? This year again ALL coaches, managers and RTOs will also need to register with Play Football. To apply for a WWCC, visit the Service NSW website to complete an online form, and complete your application by visiting your nearest Service NSW branch to get your ID checked. Once approved, your WWCC number will be emailed to you. There is no fee if you are a volunteer, parent or carer. When is my Team Selection night? Please check our website from early February for details of Team Selection dates and times. We will also supply this information on Registration Day. It is very important that you attend so we can organise teams and get you in contact with your coach and manager. This is even more important for graded teams so that we can place you in a team of similar ability. If you have any questions or just want to double check anything please contact us at [email protected]. For queries about your FFA number or online registration contact Play Football on (02) 8020 4199. For general queries contact us at [email protected] or post to our Facebook page. View our Forest Rangers FC Flyer for more information about why you should join Forest Rangers! Remember, even if you have registered and paid this doesn’t mean you are able to play or coach in 2019 as the Registrar still needs to approve this. If we don’t have the required paperwork as outlined above then we will NOT approve your registration and you won’t be able to play in trial matches or for the initial games of Season 2019. Good luck and happy registering! Remember to watch our website and Facebook page for updates.